In an earlier post, I picked a team from each of the big European leagues as candidates for “a season-long pummeling, relegation back to the second division and financial ruin” — Blackpool (England), St. Pauli (Germany) and Real Sociedad (Spain). 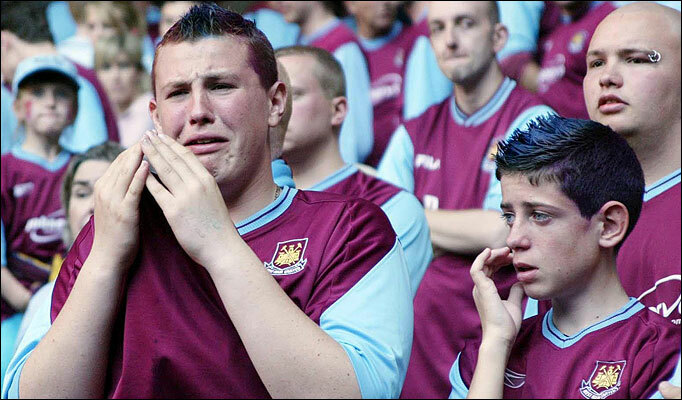 West Ham are down. Will Blackpool join them? The good news, I was right. The bad news is — same thing. St. Pauli are already condemned to return to the second division, despite beating cross-town rivals Hamburg 1-0 recently. The 1-8 humbling against Bayern was the last straw though. I think they are used to it and at least didn’t spend themselves into a hole. Blackpool are third from bottom and must win this weekend while hoping others lose. Fortunately they have an easy opponent, it’s um . . let’s see . . . Man. United, the champions. Will Man U go out with a bang, or will they play a hungover set of second-stringers? They have nothing to gain and want to rest for the Champion’s League final next week, so we will have to see. Also there’s no guarantee how Blackpool will fare against United’s second string, which is still chock-full of international stars. Real Sociedad, after looking safe all season, have picked a terrible time to give up sniffing glue. They are four clear spots (and two points) from relegation, but if they lose this weekend it could be the drop for them. What is certain is that the relegation struggle makes soccer season ends much more interesting that sports in the USA. If the NBA had relegation, The Golden State Warriors would be in the CBA — where they belong .The Niners would be in Arena Football or something. With much to play more on both ends of the table this weekend, drama will be in high supply. This entry was posted in Football and tagged doom and gloom, economics, Musings. Bookmark the permalink.